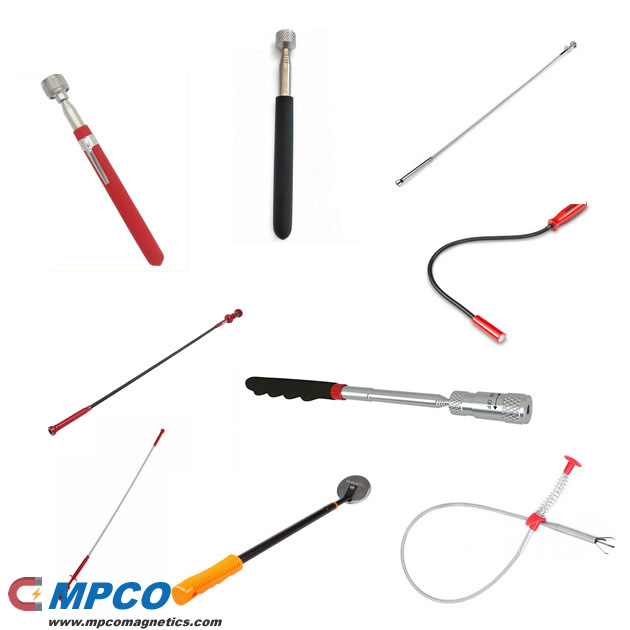 Magnetic Pick Up Tools (Magnetic Pickups, Magnetic Retrieving Tools, Magnetic Picking Device, Pick Up Magnets) from MPCO Magnetics features a powerful neodymium permanent magnet in the tip. Pick-up Tools (Magnetic Retrieving Tools) from us have prosperous styles, Lightweight Pick Up Tool Magnets inclued Bendable Pick Up Magnets, Telescoping Magnetic Pick Up/Pointers, Flexible Magnetic Pickup Tools, Extendable Pick Up Magnets, Neodymium Pocket Pick Up Magnet and Magnetic Pick-up Tool Attachment. Handy to have around for collecting dropped metal items such as screws and nuts! Pick-up tool magnets can lift up to 32 times its own weight. Magnetic Pick-Up Tools are handy for cleaning metal pieces, steel burrs, nails, nuts, screws, washers and bolts from underneath vehicles and workbenches. Widely used in workshop, parking lot, lawn, warehouse even air port…. Pick Up Tools are precision made instruments for the picking up of small metal parts such as nuts, bolt, screws, spring tools and so on in difficult to access spaces, either in the scientific laboratory or the home kitchen, automotive garage. Pickup Magnetic Tools are available in being used in a wide range. Magnetic Pickup Tool can reach long. Magnetic Pick-up tool (Magnetic Retrieving Tool) can be bent to reach almost any location. We can customize magnetic tools according to customer’s actual requirement. Copyright © 2016-2019 MPCO Inc. (Magnetic Products Co.,Ltd.) All rights reserved.